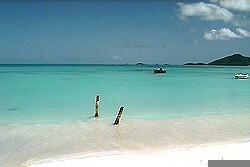 Antigua beaches: Valley Church beach. Valley Church Beach located on the West coast of Antigua just south of Jolly Harbour, offers powder white sands in the calm waters of Lignum Vitae Bay. Relax in the warm waters as local fishing boats glide by. You'll marvel at the beauty of this spot.